How should Jews respond to bin Laden’s death? SAN FRANCISCO (JTA) — When the news of Osama bin Laden’s death at U.S. hands hit the airwaves Sunday, America breathed a collective sigh of relief. 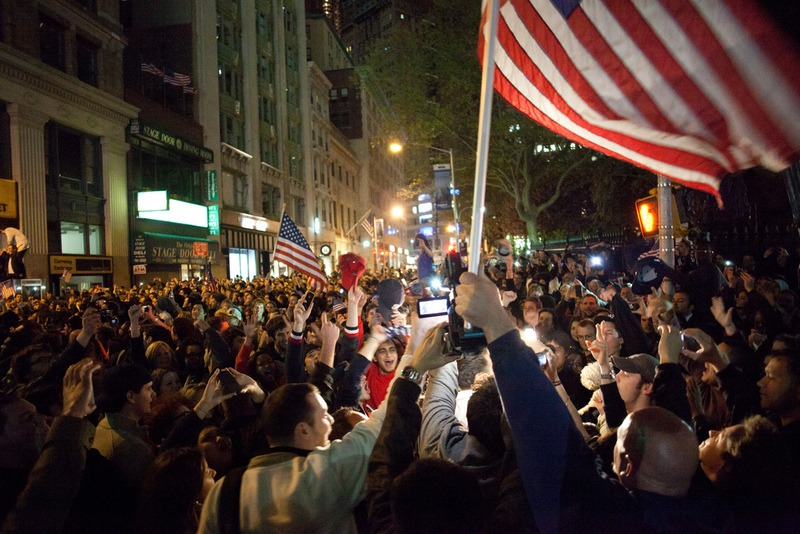 Spontaneous celebrations broke out from Ground Zero to in front of the White House, as crowds gathered to wave the Stars and Stripes and chant their delight. But how should Jews respond when an evil-doer meets his end? There is no easy answer, leading rabbis say. Even asking the question is very Jewish, writes Rabbi Tzvi Freeman on Chabad.org. “It’s so typically Jewish to feel guilty about rejoicing,” he opined. A number of prominent rabbis spoke to JTA on the subject, sharing their conflicted reactions borne of a tension within Jewish teaching itself. There are examples within Jewish tradition of celebrating an enemy’s death, of asking God for their destruction. Consider the Purim story, where the Jews feasted after slaying those who were, admittedly, arming to slay them. Or God’s command to King Saul to obliterate the entire house of Amalek for its wicked ways: “Do not spare them, but kill both man and woman, and infant, ox and sheep, camel and donkey” (I Sam. 15: 2-3). “I don’t think we ‘celebrate’ a death,” explained Rabbi Julie Schonfeld, executive vice president of the Rabbinical Assembly, the professional association of Conservative clergy. Nevertheless, Schonfeld added, one needs to distinguish between an ideal, religiously inspired response and the reality of human nature. Rabbi Basil Herring, executive vice president of the Rabbinical Council of America, the professional association for Orthodox clergy, also distinguished between the ideal and the real. Rabbi Arthur Waskow, a Jewish Renewal rabbi and director of Philadelphia’s Shalom Center, said he would have preferred that the Navy SEALS had brought bin Laden back to the United States to stand trial. Just as Israeli agents didn’t kill Nazi war criminal Adolf Eichmann when they found him in Argentina a half-century ago, but tried him in Jerusalem to expose the true horror of the Holocaust and give its victims a chance to speak their truth, so would putting bin Laden on trial have been an opportunity to uncover the real face of al-Qaida, he said. “That would have been an extraordinary act in support of upholding the values we claim make us different,” Waskow said. Pointing to the story of Moses, Waskow quotes the Midrash as saying that one reason Moses was not permitted to cross the Jordan and enter the Promised Land was because in his youth he killed an Egyptian overseer, taking justice into his own hands without bringing him to trial.